A friendly reminder: Missouri State University is hosting poets Allison Joseph and Jon Tribble tonight in honor of National Poetry Month! 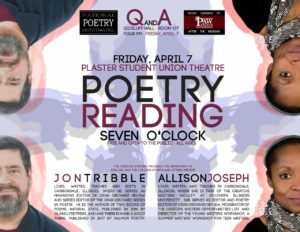 They will be reading in the PSU Theatre at 7 p.m. and signing books afterward in Paw Prints, across the atrium from the theatre. For more information, check out the event’s Facebook page here.